Mountaineering Scotland has called on the Scottish Government to review a decision which will damage one of Scotland�s most iconic landscapes. A special meeting of The Highland Council today approved three hydropower proposals which will impinge on wild land areas in Glen Etive, itself part of a National Scenic Area. Mountaineering Scotland�s Access and Conservation Officer Davie Black said: �We are disappointed at this decision as there were serious issues raised about the impact of these developments on the landscape here, an area of great importance for outdoor recreation. �What do we have to do to save our best landscapes from heavy engineering? 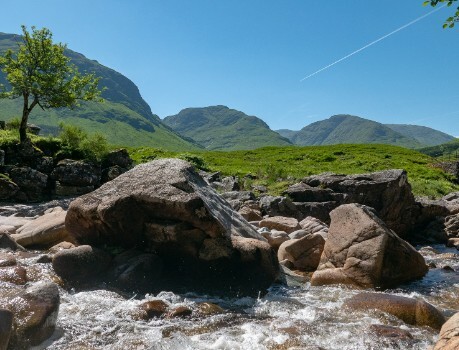 No less than seven applications had been submitted to build hydro schemes on both sides of Glen Etive � which is currently designated as a National Scenic Area and identified as having outstanding wild land qualities. Each of the schemes would involve new road construction, bridge-building, trench digging, cement-pouring and power cabling, for a relatively low power output. Mountaineering Scotland agreed that four of the proposed hydropower schemes fitted in with the already developed forestry plantations, but objected to the three applications on the eastern side of the glen which would spread development up the slopes, damaging the wild qualities of the mountainsides. Members of The Highland Council�s Planning Committee visited the glen for themselves before approving all seven applications at a meeting in February. There was widespread outcry at the decision and independent Councillor Andrew Baxter gained sufficient support for a motion to call a special meeting of The Highland Council to review the decisions in respect of the three most contentious applications - Allt Ceitlein, Allt Mheuran and Allt Chaorainn. The John Muir Trust has also expressed disappointment at the decision to approve the three schemes and warned that Scotland�s wild place are being diminished in pursuit of private profit. The Trust objected to the three applications because of their potential impact on a popular and accessible scenic landscape within a wild land area. �The John MuirTrust took a measured approach when objecting to the proposals as we are very concerned at the continued diminishing of Scotland�s wild places at the hands of developers whose sole objective is private profit.